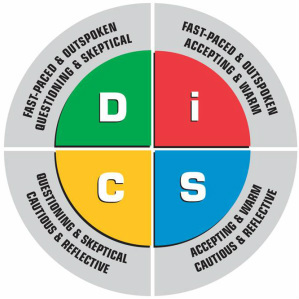 DISC is the four quadrant behavioral model based on the work of William Moulton Marston PhD (1893–1947) to examine the behavior of individuals in their environment or within a specific situation (otherwise known as environment). It therefore focuses on the styles and preferences of such behavior. This system of dimensions of observable behavior has become known as the universal language of behavior. Research has found that characteristics of behavior can be grouped into these four major "personality styles" and they tend to exhibit specific characteristics common to that particular style. All individuals possess all four, but what differs from one to another is the extent of each. For most, these types are seen in shades of grey rather than black or white, and within that, there is an interplay of behaviors, otherwise known as blends. The denotation of such blends starts with the primary (or stronger) type, followed by the secondary (or lesser) type, although all contribute more than just purely the strength of that "signal". Having understood the differences between these blends makes it possible to integrate individual team members with less troubleshooting. In a typical team, there are varying degrees of compatibility, not just toward tasks but interpersonal relationships as well. However, when they are identified, energy can be spent on refining the results. Below is a brief summary of the profile of Christian Whamond. A full report is available upon request. More information on Disc at Wikipedia. Focused on shaping the environment by overcoming opposition to achieve results.Like to take action to achieve the results they desire. Seek opportunity for advancement and individual accomplishment. A quick thinker who displays self-confidence. You are usually determined and persistent. Trouble shooting issues and solving problems do not intimidate this type of person, even if it means questioning the status quo. They have no problem tackling varied activities and embracing a wide range of tasks. Heavy opposition or distracting events usually do not effect there unwavering focus on accomplishing there goals. Being self-focused can be a benefit to the team when red tape or lack of consensus sidetracks your colleagues. Can be a inspiration to others who might be reticent to share their opinions and ideas freely. Help others to visualize the steps that are necessary to accomplish results. Being goal-oriented and decisive can benefit the bottom line for a team or organization. Comfortable applying pressure to others to achieve desired results. This can be viewed as a strength when working with others toward a common goal or deadline. Self assured as you encounter new situations, people, or problems. Rarely reactive, more likely to respond calmly to whatever comes your way. Combined with emotional intelligence and leadership ability, your skill at capturing the attention of others and winning them over has a lot of potential. Have a strong belief in your own powers to get the job done can inspire others to take risk that could lead to new levels of success. Like to take in as much information as possible before taking action. It is a strength when working with others because you help inform their decisions. Look for new ways to test your abilities and better develop your skills to accomplish results. You strenuously push yourself to accomplish solid results. Acts as a "people mover"
Accomplishes goals with the team.